While i was writing my last post on some of the concepts needed to build a better world, i stumbled across this piece on Sandra Day O’Conner being part of a poly V, with her husband and another Alzheimer patient woman identified simply as “Kay” in the articles. What is interesting to me in these articles is that the ex-supreme court justice is given a pass by the media on what would, i believe, would clearly be considered unacceptable behavior for say an entertainer. The reason for this is three fold. The first is that she and her partner are old – both 77 when the news broke. Second is she is smart, the first female supreme court justice served on the Stanford Law Review, was elected to the Arizona state senate twice and was the majority leader. Also despite being unwilling to overturn Roe vs Wade, she was confirmed by he Senate 99 to 0. But it is the third thing which i think clinches it – her partner was sick and had been for 17 years at the time he found his new partner. O’Connor spoke publically about her breast cancer and mastectomy. She advocated for Alzheimers patience and cancer research. She was denied work as a lawyer in all the firms she applied to after graduation, because she was female. And in her own way, she advanced radical intimacy. 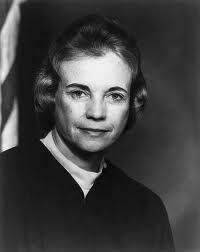 Sandra Day O’Connor’s husband’s experience of Alzheimers, and her own, makes the illness seem much less bleak. Have Alzheimers –> in new found love –> Wife of many years happy about it too? Beautiful. a google search for “Sandra Day O’Conner Alzheimer’s Compersion” defaults to a search for “Sandra Day O’Conner Alzheimer’s Comparison”. once you tell it, ‘No, I meant what I said’ this blog post is the first result. Thanks what a sweet piece of information.